The 1820s saw the maturation of cartographic publishing in the United States, heralding the “Golden Age of American Cartography”.1 Atlas publishers in the first years of this era included, Carey & Lea, Fielding Lucas, Henry Tanner, and Anthony Finley. State 3: 1831-1834 – Extensive detail added in surrounding states, including “Georgia”. Macon County added in western NC. State 4: 1842 – dashed lines added to indicate geological zones; map is colored by geological zone rather than by county. State 5: 1845-1846 – Map again colored by county; many new counties and place names added. New counties include Cherokee, Yancy [sic], McDowell, Henderson, Cleveland, Caldwell, Catawba, Davie, Stanly, Union. New outer border, likely via geometric lathe. A few additional distinguishing features, the publication history for each state, and links to high-resolution images of each state are available on this pdf. Alternatively, it is available via this Google Sheets link. Please note that the information provided may not include every change to the plate, but is sufficient to identify the different states. If anyone identifies a state of the map not recorded in the spreadsheet, please let us know via the “What’s on your mind?” comment box below. 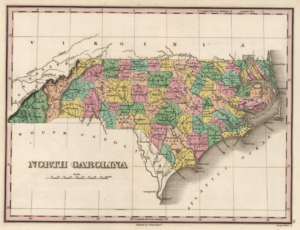 Finley’s map of North Carolina was also sold separately as a pocket map, but no surviving copies have been located. As a representative example, a copy of Finley’s A New General Atlas map of Louisiana that was sold as a pocket map can be seen here. Finley’s first cartographic atlas was published in 1818, the Atlas classica, or, Select maps of ancient geography, both sacred and profane, for the use of colleges and schools in the United States. This atlas contained nine historical maps. A rather lazy search easily locates later editions in 1824 and 1831, the latter frequently (always?) bound with the 1831 General Atlas. Anthony Finley also published a larger map that included NC, SC, and Georgia. Its publication history by Finley and others dates from 1824 to at least 1845. The cartobibliography for that map may be the subject of a future blog post. Walter Ristow, in American Maps and Mapmakers: Commercial Cartography in the Nineteenth Century; 1985. 1811 Catalogue of Books in Medicine, Surgery, Anatomy, Physiology, Chemistry, Mineralogy and Botany for Sale by Anthony Finley: Corner of Chesnut and Fourth Streets, Philadelphia. The American Advertising Directory, for Manufacturers and Dealers in American Goods. For the Year 1831. New York: Published by Jocelyn, Darling & Co. No. 36 Wall Street, p197. Finley’s 1811 edition of Clarke’s Travels…, including images of the above maps, can be seen via infoweb.newsbank.com. Access requires institutional subscription. See UNC catalog entry here; also accessible through other university libraries. This entry was posted in 19th Century, Cartobibliography and tagged Anthony Finley, cartobibliography, north carolina maps by crmaps. Bookmark the permalink. Hi there. I would like to ask permission to use the image above (NC map) on my website. Do you have contact info for David Ramsey? Thanks!